Guided visits of the village can be organized. Do not hesitate to contact the Tourist Office in Beaulieu sur Loire. Enquiries : 02 38 35 87 24. 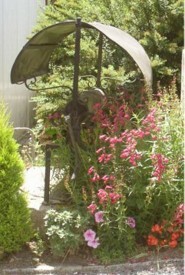 About 200 wells are scattered all over the 51 hamlets of the village. With the guided tour of wells, go off the beaten track on bicycle. A paper guide is available. Evening strolls through the countryside during the tourist season. Appointment at 8:30 pm in the place of the Tourist Office. Guided visits of the village can be organized. 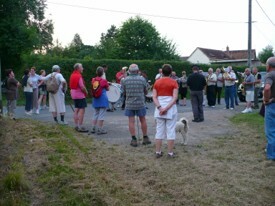 Do not hesitate to contact the Tourist Office in Bonny sur Loire. Enquiries : 02 38 31 57 71. 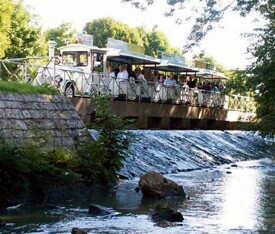 The Tourist Office proposes guided visits of the town of Briare "ville fleurie", its cultural heritage "l’Eglise Saint-Etienne, enamels and mosaïcs, the Loire river banks, the canals and the famous Pont-Canal "built by Mazoyer, Daylé and Pillé and Eiffel". Do not hesitate to contact the Tourist Office in Briare. 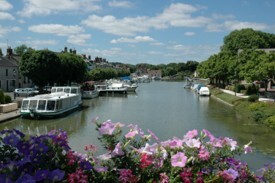 Enquiries : 02 38 31 24 51.
running alongside the waterways for a commented tour of the town ; 45 minutes. A commented tour available in French, English and German. Departure : 2 pm, 2:45 pm, 3:45 pm and 4:45 pm. From March the 28th to June the 27th : Sunday and bank holiday. From June the 28th to September the 26th : everyday. From September the 27th to October the 10th : Sunday. For groups : open all over the year. Guided visits are organized on Wednesdays morning, in July and August. The appointment is fixed at 10 am. Free guided tour. Appointment at the Tourist Office (47, Franche street). Appointment at the lock House.